Within the TIDE project, analysis has been undertaken on methods for zonation within the estuaries in order to provide a basis for inter-estuarine comparison analyses and other management approaches. These zonation methods are discussed in the Geerts et al., 2012 TIDE report. As such, each TIDE estuary has been divided into a series of zones with, where practicable, zonation based upon the salinity conditions of the estuary reach, but also reflecting broader estuarine management requirements where applicable. For instance, the Humber Estuary has primarily been zoned based on an existing management framework operated in the estuary, but with salinity parameters allocated to the zones as a ‘best fit’, whilst the Elbe Estuary utilises a number of smaller existing management sub-zones within the broader salinity classification developed in TIDE. 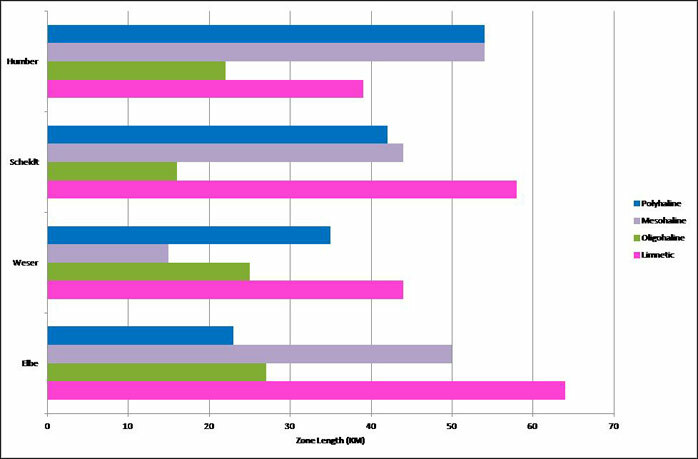 Figure 2 illustrates the relative distribution of the main management zones identified within each of the TIDE estuaries, the graphic produced on the basis of length of zone reach expressed as a percentage of total estuary length, and with the zones numbered from the TIDE 0km (Zone 1) to the mouth of each estuary. 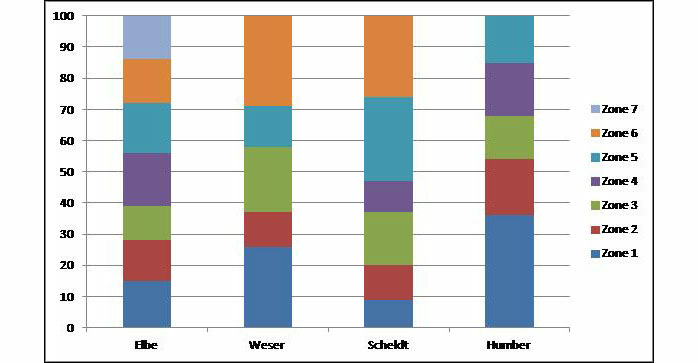 Figure 2 indicates that within the Elbe Estuary, zonation along the system is almost equally divided along standardised lengths, whilst for the Weser Estuary longer zones are present at the mouth and inland reaches, for the Scheldt Estuary the outer half of the estuary length is comprised of two of the six zones, whilst on the Humber Estuary, management zone length is greatest along its tributaries. These differences obviously reflect variations in salinity regime along each of the TIDE estuaries, but also different methods applied to deliver appropriate ecosystem management. When analysing the outcomes from the conflict characterisation and assessment process, it is therefore important to bear these zone length variations in mind. For instance, a series of high conflict scenarios within a long estuary zone may be more of a management priority than those from a relatively short reach. However, it is also noted that this analysis considers only zone length, rather than area, and other spatial considerations may therefore also require consideration in some circumstances. By placing the management zones for each estuary within the four main salinity classes (Limnetic (Freshwater), Oligohaline, Mesohaline and Polyhaline), some broad patterns of zonation distribution across the sites can be identified (Figure 3). The Elbe in particular, has a dominant limnetic zone and relatively short polyhaline zone, with the Weser and Scheldt also featuring a dominant limnetic zone reach, but with relatively long lengths of other zones also present (polyhaline and mesohaline in the Scheldt and polyhaline in the Weser). For the Humber, the polyhaline and mesohaline sections of the estuary dominate the system, but with a relatively long limnetic zone also present (along its tidal tributaries). Figure 2: Relative extent composition of management zones established for the TIDE estuaries. Figure 3: Salinity zone length comparison for the TIDE estuaries (in km). Figure 4 compares the percentage length of the four salinity zones for each of the TIDE estuaries. This indicates that in terms of percentage distribution of zones, there are differences between all estuaries. 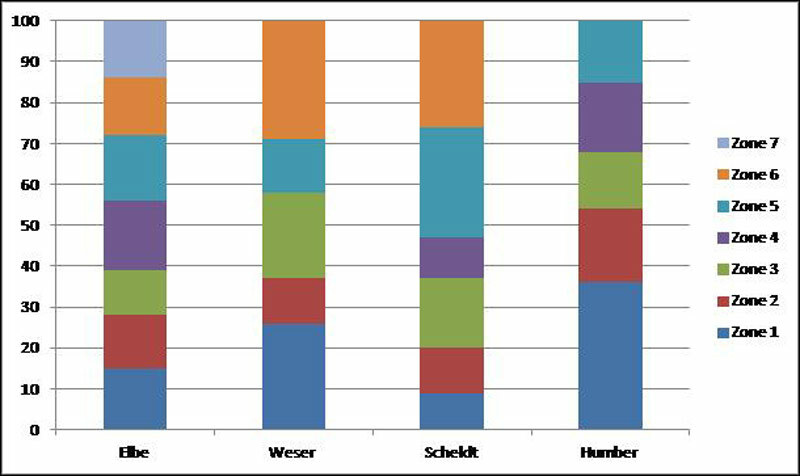 The Elbe, Weser and Scheldt have broadly comparable limnetic (freshwater) zone contributions, but with the Scheldt featuring a reduced oligohaline contribution, compared to those of the Elbe and Weser which in combination with the limnetic zone accounts for over 50% of total length in both cases. However, there is considerable variation between the contributions of mesohaline and polyhaline reaches of these three estuaries. The Humber features relatively large mesohaline and polyhaline zone contributions, these covering almost two thirds of the total system and the majority of the estuary itself. Figure 4: Salinity zone relative extent for the TIDE estuaries. Any relevant correlations relating to conflict matrix outcomes and salinity and management zonation schemes for each of the TIDE estuaries will be addressed later in this report.